Overview: Thyrocare is a top 4 player in the pan-India diagnostic lab companies. Revenue, EBITDA and PAT have grown 23.7%, 19.4% and 15.7% CAGR over 4 years. The key strengths of Thyrocare are – 1) strong hub and spoke model for diagnostics collections and testing; 2) good growth visible in domestic diagnostics, in foreign diagnostics, and the Nueclear Healthcare – NHL and water testing businesses 3) Strong franchisee network 4) Positive free cash flow, and growth to be funded from internal accruals 5) Good management team. Thyrocare has an asking PE of 44.9 times FY16 (P) which seems expensive. However comparing with Dr Lal Pathlabs, and retail food service firms, the valuations look reasonable. Here is the investment note on Thyrocare Technologies Ltd. (Thyrocare). Shares offered to public: 1.07 cr of FV Rs.10 which is 20% of equity. The sellers and offered shares are: shown in Exhibit 1 – Selling Shareholders. Amount proposed to be raised: Rs.480 cr. by Offer for Sale OFS route. Market Lot: 33 shares and in multiples of 33 shares there off. The issue is mostly a sale by PE investor Agalia Pvt Ltd., which holds 22% and is selling 90.4% of this. There is no fresh issue. The promoter stake would reduce to 64% from 65% post IPO. See Fig 2b. Thyrocare is a Mumbai based diagnostic lab company with services in India and a few other countries. Thyrocare had revenues, EBITDA and profits of Rs 190.3 cr., Rs 79.2 cr. and Rs 44.4 cr. resp. in FY15. It operates its testing services through a fully-automated Central Processing Lab (CPL) in Navi Mumbai and 5 Regional Processing Labs (RPLs) in New Delhi, Coimbatore, Hyderabad, Kolkata, and Bhopal. Thyrocare collects samples through a pan-India network of franchisees of TAGs (Thyrocare Aggregators) and TSPs (Thyrocare Service Providers). It has a network of 1,041 franchisees, comprising of 687 TAGs and 354 TSPs spread across 466 cities and 24 states and UTs. Thyrocare offers 198 tests and 59 profiles of tests to detect a number of disorders, infertility and infectious diseases. Their profiles of tests include 16 profiles of tests administered under their “Aarogyam” brand, which offers patients a suite of wellness and preventive health care tests. Fig 3a. A wholly owned subsidiary, NHL (Nueclear Healthcare Ltd) operates a network of molecular imaging centers focused on early and effective cancer monitoring. It merged with Thyrocare in Dec 2015. In order to further expand their offering of tests, they are now using the CPL to test new technology and develop innovative testing. In FY15, they explored new specialized testing techniques such as cytogenetic testing, water testing and the development of new tests based on mass spectrometry. Thyrocare obtains its machinery, instruments and other equipment from international and Indian vendors. Siemens Ltd. is their largest supplier. Thyrocare operates with a hub-and-spoke model. The chain is of CPL-RPL-Satellite Labs – Collection Centers (CC). The CCs are located in hospitals, nursing homes, pathology labs, doctors’ clinics, prime commercial properties and retail spaces among other places. CCs may be company-owned or franchised. A franchisee usually pays a fee, Rs 30-50,000 to sign up. CCs do not carry out any testing, and are involved only in the collection/ forwarding of patient samples to a satellite or reference lab. The TAGs and TSPs franchisee model reduces last mile costs and efforts of Thyrocare. This is a nimble and efficient model that can scale up rapidly too. In the CPL, Thyrocare enters into equipment leasing arrangements, which vendors provide for a purchase commitment of reagents and consumables. This helps reduce capital equipment costs. Since opening the RPLs in 2015, the volumes growth has been excellent: The diagnostic tests daily volume grew from 95,610 (FY14) to 159,350 (9m FY16). The annual data is a CAGR of close to 38% over the past 3 years from 2.5 crore tests (in FY13) to 5.38 cr. tests (11 mths of FY16). The PET-CT scans performed by NHL grew from 34 scans (FY13) to 11,173 scans (FY15). 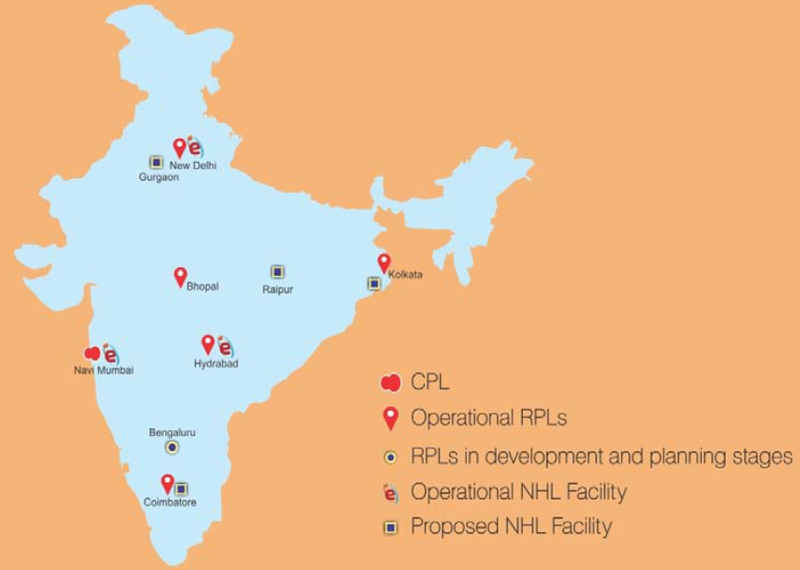 To grow their business and volumes of samples processed, they plan to expand their network of RPLs and have a lab in every Indian city with an airport, to reduce the turnaround time to deliver the reports to the end customer. The firm has opened labs in Coimbatore, Bengaluru, Hyderabad, Delhi and Bhopal. Outside India, Thyrocare appears to be present in Afganistan, Bahrain, Bangladesh, Egypt, Iraq, Kuwait, Nepal, Oman, Qatar, Saudi Arabia and United Arab Emirates. Thyrocare was looking to list its shares last year, but the issue was stuck on a minor technical issue with the Companies Act, 1956. The clause was relaxed in the 2013 Act and Thyrocare could proceed. The Thyrocare staff includes medical doctors, PhDs and postgraduates in biochemistry, pathology, microbiology and other related disciplines. The company has 718 employees (including consultants, nuclear medical professionals, trainees and contractual employees). Thyrocare Bangladesh Ltd had recently started offering a service where blood tests could be done at home and reports were delivered to the customers. Thyrocare developed a new automation track in Mumbai in 2014, Aptio Automation, which was able to reduce the turnaround time on a blood sample from 4.5 hours to 2.5 hours. Thyrocare has an experienced management team. Dr. A. Velumani is the promoter, MD & CEO and has 19 years of experience in the diagnostics business. Prior to this, he worked for 12 years as a scientific officer in immunodiagnostics and radioimmunoarrays, at BARC Mumbai. Mr. A. Sundararaju, Director & CFO is a graduate in law from the Univ. of Bombay with 18 years of experience in finance, legal and administrative activities. Mr. Sohil Chand, Director holds a PG in Accounting & Finance from the Univ. of London and an MBA (Univ. of Chicago). His 14 years of experience is in financial services industry, including PE, VC and I-banking. A personal visit: We visited a Thyrocare franchisee to better understand their business and get personal impressions. The Thyrocare franchisee is well located and has a small office with simple furniture and décor. The staff was hospitable and courteous, explained the services, handed over a brochure, and was willing to give better services/ home delivery and pick up at reasonable rates. We also noted that Thyrocare services were 20-30% cheaper than Dr Lal Pathlabs for similar services. According to the Global Health Expenditure Database compiled by WHO, India’s total expenditure on healthcare was 4% of India’s GDP as of 2013. India trails not just developed countries such as the USA and UK, but also developing countries like Brazil, Russia, China and Thailand, in healthcare spending to GDP. This is due to the under penetration of healthcare and lower consumer spending. Industry estimates show there are over 100,000 diagnostic laboratories across the country. Pathology labs represent around 70% of this, and Radiology and high end imaging is 30% of the industry. Size of diagnostic industry pegged at around Rs 33,000 cr. ($5 b), growing at 15-16% annually. National chains like Dr Lal Pathlabs, Metropolis, SRL Diagnostics, and Thyrocare are present. But Unorganised players dominate 88-90% of the industry. Urban areas account for higher revenues in diagnostics. According to CRISIL Research, India’s urban population (28%) contributes up to 67% of revenues in diagnostics. The Govt. accounted for 32.2% of healthcare spends in India (2013), a small increase in 10 yrs. 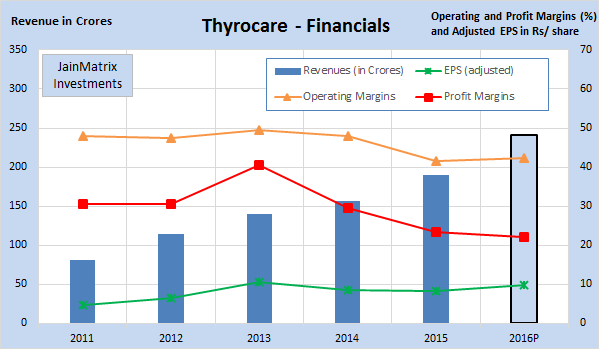 Thyrocare Revenue, EBITDA and PAT have grown 23.7%, 19.4% and 15.7% CAGR over 4 years. Fig 4. For 9 months of FY16 the EPS stood at Rs 7.45 and the projection for FY16 is Rs 9.93. The EPS growth is 20.1% over FY15. Note FY16P data is a simple projection of 9 months of FY16 data. The operating margin has decreased slightly from 47.9% in 2011 to 41.6% in 2015. However for the first three quarters of FY16 the figure stands at 42.2%, a small gain. Thyrocare is the leader amongst the pan India diagnostic players in terms of margins. The company did not have any free cash flows in two of the last 5 years. See Fig 5. Heavy investments were made during that period. The projected free cash flows for FY16 are excellent. It’s a zero debt company. Thyrocare appears to be the smallest of this group. However, since most of the front end is outsourced to franchisees, the gross revenues may be much higher than this. Thyrocare appears to be available at a discount to Dr Lal Pathlabs, the closest peer. Margins are high for Thyrocare. This is a big plus. On the other hand, growth while high, is lower than the leaders here. With the building of the hub and spoke model, growth can improve in the next few years. But it may come at the cost of high margins. Debt is zero, which is good. RoE is low but this is due to a number of recent growth initiatives – NHL as well as international. It appears that the diagnostics sector is underpenetrated, so there is a massive room to grow. It’s a high growth business with initiatives like the core diagnostics in India and abroad, the NHL and water testing. These are being funded from internal accruals, and can be very profitable soon. The financials have seen robust growth over 4 years. This may continue with their strong all India footprint. The IPO valuations are attractive on a relative basis. Their hub and spoke & franchisee model is profitable for Thyrocare as it reduces the cost of expansion, and the last mile and customer acquisition is done by the partners. It has the best EBITDA and Profit margins among pan India diagnostic firms. Debt is also zero. Also Thyrocare is very asset light. Thyrocare has an experienced management team. The firm, and most of the new initiatives are the brain-child of CMD Dr. A. Velumani. He has sharply defined testing and diagnostics as his focus area. Promoters are retaining control of the firm at 64% ownership, this is a good sign. The recent success of Dr Lal Pathlabs IPO, Alkem Labs and Narayana Hrudalayala, and the appreciation thereafter are positives. We must note the optimism around healthcare and diagnostics industry. With so many positives, we feel that this IPO offer is going to provide Wellness for your Wealth !! Thyrocare’s business depends on their reputation and brand, and any negative publicity or other harm may materially and adversely affect their business, financial condition and results of operations. 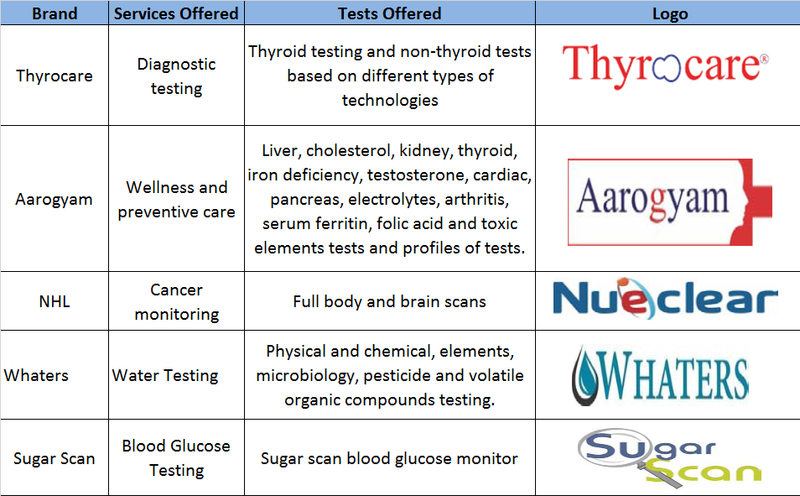 Thyrocare’s business is more dependent on a few tests. So wellness and preventive care (51%) and thyroid (17%) dominate the diagnostic services for FY15. There is product concentration risk. Their subsidiary, NHL, operates a molecular imaging business that presents significant operational risks, and is loss making since 3 years. This could have an adverse effect on Thyrocare financials. Similarly, the Gulf and Mauritius subsidiaries, set up recently, are also loss making companies. The land and premises on which the CPL and the RPLs are located are held by them on a leasehold basis or on a leave and license basis, which subjects them to certain risks. Their business is subject to seasonality, so revenues can be lumpy. Thyrocare operates in a competitive business environment which has low barriers to entry, from local /unorganized sector outlets and even city/ regional chains. There are a lot of grey areas policy wise in this sector. Regulatory frameworks include Clinical Establishment (Registration and Regulation) Act 2010, but it has been adopted only by a few states. It does seem to be a largely unregulated sector without norms or necessary standards. Political instability or disruptions at locations where they operate can affect business. India with its large and growing population is stretched in terms of available healthcare facilities. Expenditure in this sector will trend upwards as the economy develops. The Govt’s free facilities are in low supply and cater to the low end of market. In this space, Thyrocare’s diagnostic and testing services provide an essential, high demand service. It is a wellness/ preventive as well as an essential service. The business model is robust and scalable, and there are clear benefits of a national chain over small and local service providers. 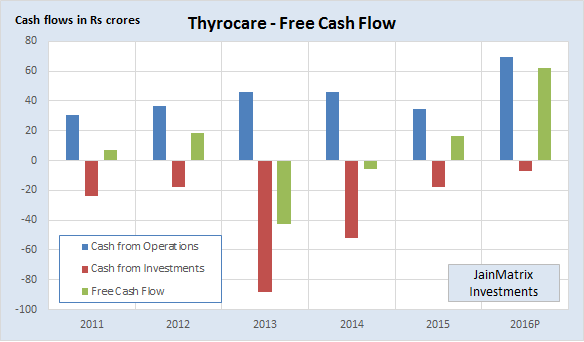 Thyrocare is in 3-4 high growth areas, and is now generating enough cash to invest in them. We expect the financials to grow faster in future. In terms of valuations, Thyrocare has an asking PE of 44.9 times FY16 (P) which looks expensive. However looking at the valuations of Dr Lal Pathlabs as well as those of retail food services (a business model comparable), then the valuations do not look expensive. As an investment, the Thyrocare IPO is rated a medium risk, high return type of offering. Retail Investors can BUY this IPO with a 2 year perspective. Here is a note on the Thyrocare IPO in PDF format. Click the link above to open/ download the PDF document. Syngene IPO: Good Pharma R&D spinoff from Biocon. Search for companies/ sectors of your interest in Search box in the right panel. This document has been prepared by JainMatrix Investments Bangalore (JM), and is meant for use by the recipient only as information and is not for circulation. This document is not to be reported or copied or made available to others without prior permission of JM. It should not be considered or taken as an offer to sell or a solicitation to buy or sell any security. The information contained in this report has been obtained from sources that are considered to be reliable. However, JM has not independently verified the accuracy or completeness of the same. JM has no known financial interests in Thyrocare or any related group. Neither JM nor any of its affiliates, its directors or its employees accepts any responsibility of whatsoever nature for the information, statements and opinion given, made available or expressed herein or for any omission therein. Recipients of this report should be aware that past performance is not necessarily a guide to future performance and value of investments can go down as well. The suitability or otherwise of any investments will depend upon the recipient’s particular circumstances and, in case of doubt, advice should be sought from an Investment Advisor. Punit Jain is a registered Research Analyst (SEBI Registration No. INH200002747) under SEBI (Research Analysts) Regulations, 2014. JM has been publishing equity research reports since Nov 2012. Any questions should be directed to the director of JainMatrix Investments at punit.jain@jainmatrix.com.